This charming farmhouse from 1700 is luxuriously furnished with a lovely ambience and has separate guest quarters. It is located a few kilometres from Condom, a town with markets, a cafe and a river where you can hire boats. The Compostela pilgrimage route passes through the village and you will find delicious wines to sample everywhere. This is a great area for anyone who loves hiking, cycling and water sports. Golfers can also try their skill at one of the area's spectacular courses. The farmhouse is situated on lovely rolling grounds with large lawns where the kids will have a wonderful time playing. For extra amusement there is a trampoline, a ping-pong table and a swing hanging from a big tree branch... The swimming pool is fenced and you will find sun loungers and sun umbrellas on the terrace. The farmhouse has a long, partially covered terrace that is a great spot for a meal. Inside you will find a pleasant living area with lovely wooden beams and a high ceiling. The bedrooms are equipped with excellent beds and the bathrooms are clean and fresh. 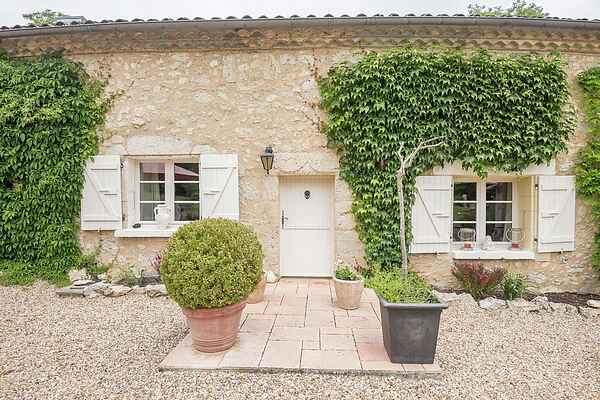 The same applies to the charming guest quarters, situated less than 50 metres from the farmhouse. Highly recommended.